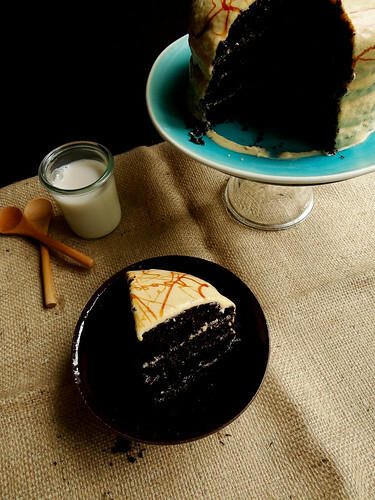 the chocolate cake recipe has been my "go to " recipe for chocolate cake since i can remember. it is a quick, easy no fail recipe. the salted caramel was inspired by a jar of caramel that i won through Richa at Hobby & More VSPCA fundraiser....caramel that I would have had an all out bidding war if it came down to it....thankfully for the other person it didn't come down to that. salted caramel frosting is nestled between each layer. 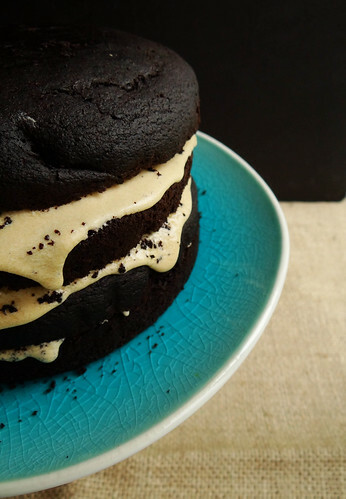 i love the contrast between the dark, almost black layers against the lighter caramel colored frosting. additional caramel is drizzled over the top. feeling super fancy? drizzle additional caramel between each layer after each frosting layer. 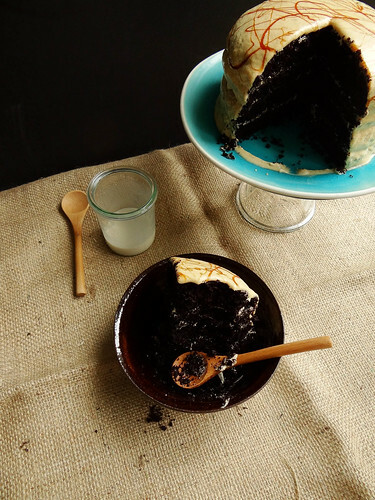 hmmm, why didn't i think of this while i was making my cake?this recipe can easily be double to make (2) 8- inch cakes - which would be well suited for a larger crowd.since the cake is so rich and decadent, we were able to get 6 servings out of this mini version. sift flour through baking soda in a large bowl. stir in remaining ingredients until smooth. 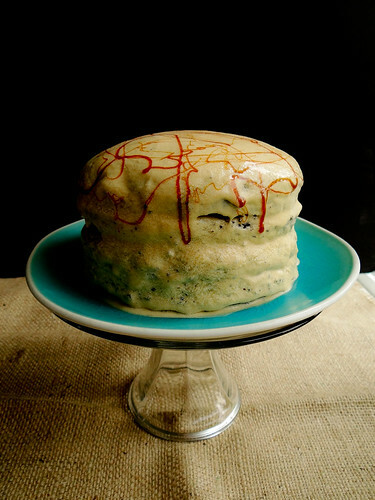 pour equal amounts of batter into the 2- 6 inch cake rounds or all into the 8-inch if using. 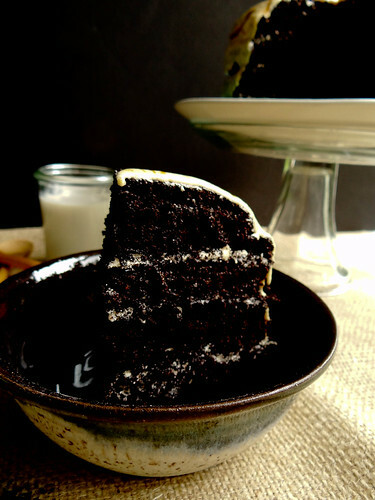 bake for 25-30 minutes or until a tooth pick comes out with a few moist crumbs when tested in the center of each cake. remove from the oven and cool in the pan on a wire rack. while the cakes are cooling, make the frosting & caramel if making. in the bowl of a stand mixer, with the paddle attachment mix powdered sugar and butter on slow speed until mixed. slowly add vanilla & almond milk. 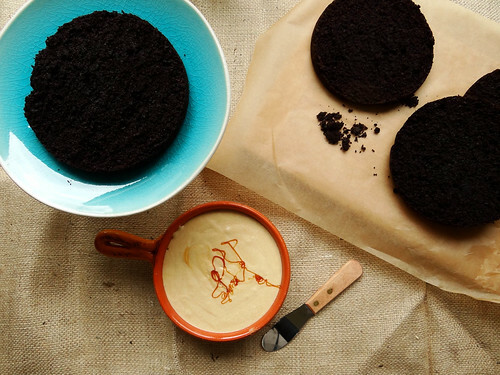 stop the mixer and add vegan salted caramel - mix well. Add additional almond milk if needed to reach desired consistency. flip the cakes over and remove parchment paper. with a serrated knife, slice each cake in half lengthwise. place one piece out of the four halves on a plate, lightly frost the half. place another round on top of the frosting - repeat until all layers are frosted. frost the top and sides with remaining frosting and drizzle with an additional tablespoon of caramel if desired. 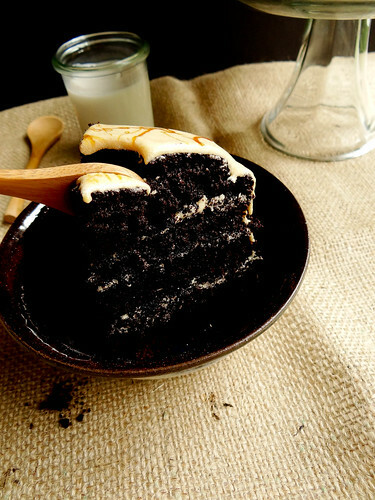 i love when friends LOVE my baked goods <3 this cake looks absolutely SINFUL! and ooey-gooey super delicious. Who wouldn't love those amazining cupcakes and cake you made for Karen - they would be totally crazy if they didn't love anything you made! ....this cake is fabulous ! How wonderful it is when your friends love your dessert :) It looks super delicious!! Thanks Lysa - it is a good feeling isn't it! YUM! I love salted caramel. I don't understand why they won't let me pour it over everything in the bakery. I think it would all of the treats sell faster, right?! Seriously, I would buy the entire bakery out if everything was covered in vegan salted caramel! You should totally start your own bakery called Salted Caramel!!! Holy mother of deliciousness, Batgirl. How did that not evaporate the instant it was complete? I'd have stuck a fork in just for quality control purposes you understand, then have had to make another for my guests. It's always nice to have a good excuse to bake something. Your cake looks divine! Oh geesh I can make up any type of excuse to bake -"oh, it ______ (insert any word here) lets make _______ (insert anything sweet here)"
Awww thanks Kristy! YOU are so inspiring yourself, you know that right? I am rationing the Caramel I won from Richa's fundraiser, I don't want it to dissapear to quickly! Oh my god. 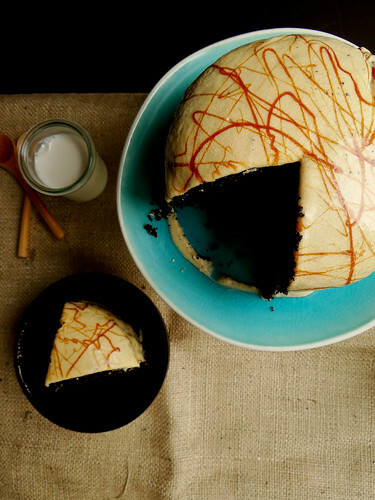 I think I just had a minor heart attack because of how incredibly delicious this cake looks. I'm not sure if I will be able to sleep until I make it. That first photo is a knockout! 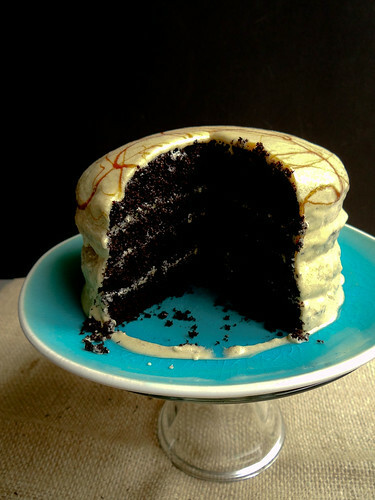 i agree with everyone.. this is just gorgeous gorgeous soooo dark, rich, gorgeous and i can imagine sooo delicious! i sure want you you to bake me anything(read this cake) when i visit. love that caramel drizzle on top and the moody pictures! 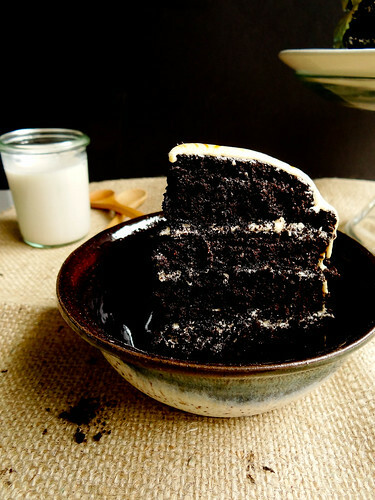 I need to pick u some dark cocoa and make this pronto. If you visit Richa I promise to bake/make anything you want...on one condition - you make me an amazing Indian meal! If we lived closer this cake would have been an absolute given! That looks out of this world! Wish I could pluck out a piece from the screen. Cake for 2 coming right up! Oh my gosh...this look OUTRAGEOUS!! 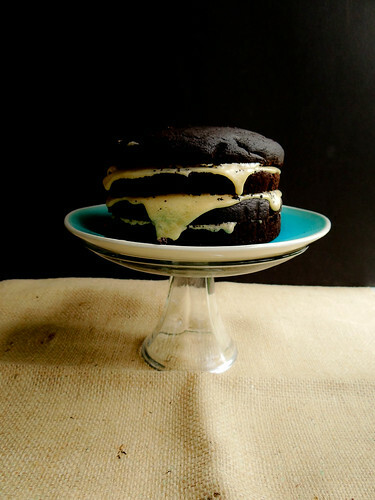 The fudginess, the richness, the gooeyness, the decadence, the frosting! WOW! This is one show-stopping cake! and your photography captures the drama that IS this cake! Your friend is going to go bonkers over this treat:) Thanks for sharing such an amazing cake! Hugs! Wow wow wow. This looks amazing! I love chocolate and salted caramel. I'm going to have to find (or make up) a special occasion so I can make this cake! Hmmm a special occassion - how about "you a re fabulous!" Day? Haha I like that - a Big Hunky Chunk of Cake, perfect description! ooo Epic, I love it! Ummm. I've been away for a month, too!! They just let me out. Can you save me a slice of this delicious cake? Oh goodness, you mean they didn't feed you delicous vegan chocolate caramel cake? I promise to save an entire cake just for you! Can we be friends so you will make me some cake?!? ;) Wowza! I took one look at this picture and my freaking jaw just hit the table. REALLY????!!!!!!!! Freaking Heather. You are amazing. Really, yes really. Would I lie to you? Hello, I was just wondering, do you have to use spelt flour or can you use all-purpose? I'd love to make this, but I'm a poor college student and I don't want to buy flour that I wont ever use again, other than on this recipe. Thanks! And your blog is wonderful, by the way! You definitely could use AP in place of spelt - let me know how it turns out with the substution! Gosh, THIS is a real chocolate cake! So dark and fluffy and yummie... I need a piece of this. Now. Please! hi amazing recipe. I ve been looking for this for a year! For the caramel sauce, is there any other recipe besides the one on the link ? The products on the link are not available easily in India, especially where I live.